Yesterday, to celebrate our forty-first wedding anniversary, Clif and I went to Bath, Maine, a small city of a little over 8,000 people. 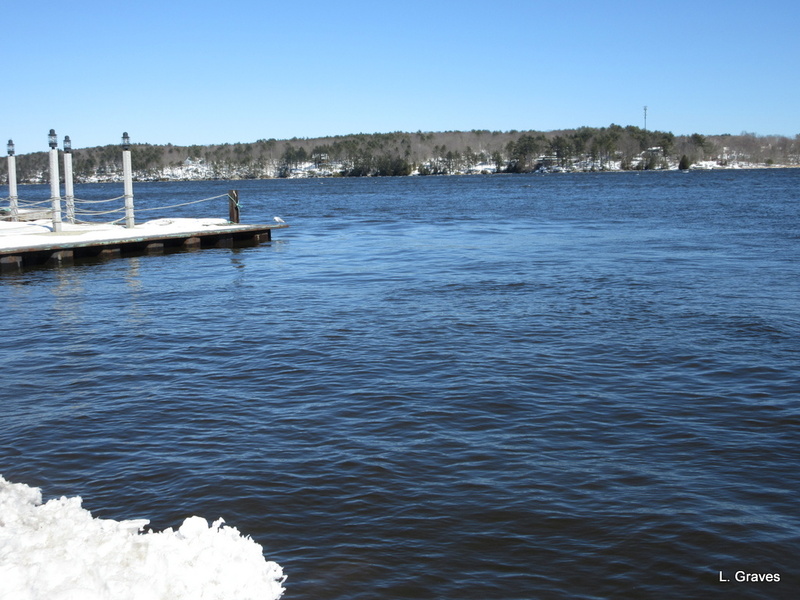 Bath is nestled beside the Kennebec River, and it is close enough to the ocean for the river to be visibly tidal. Because of this, Bath definitely has a coastal feel. The day was clear, cold, and beautiful, much like the day we were married, and the ride to Bath, about an hour away, was sheer delight. We had a gift certificate to J. R. Maxwell’s in downtown Bath, but Clif suggested that we celebrate in stages to make the outing more festive. A great idea, and that is exactly what we did. First, we went to the Kennebec Tavern, which is on the edge of town, right by the Kennebec River. I have lived near the Kennebec for most of my life, and how I have come to love this protean waterway, always moving, always unpredictable. In Bath, the Kennebec is wider than it is in central Maine, where we live. It’s almost as though the river is opening up as it rushes toward the sea. 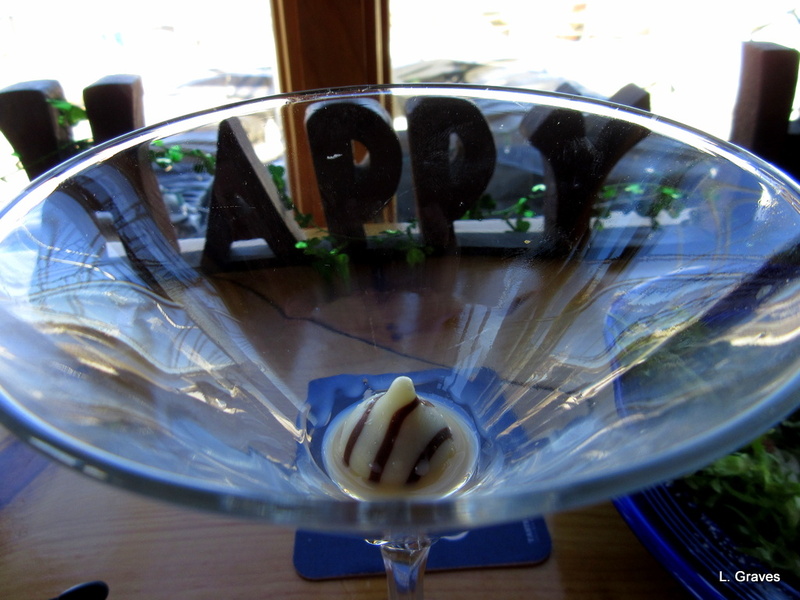 Clif ordered a Baxter IPA, and I ordered a martini made with vodka and Bailey’s Irish Cream. 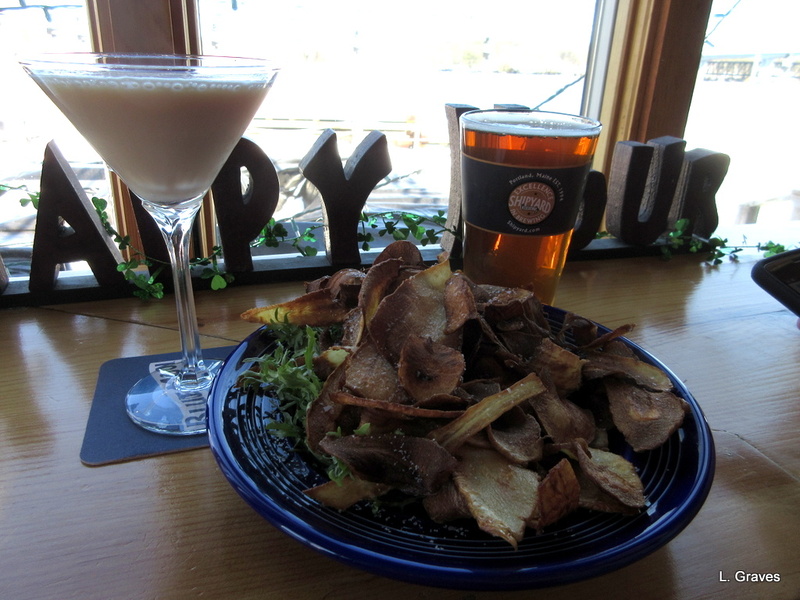 As an appetizer, we had a plate of fried parsnip chips. Very tasty. As we sipped and ate and toasted ourselves, we sat by windows overlooking the river. Happy was just how I felt as I came to the end of my drink and discovered a little treat at the bottom of my glass. After drinks, it was off to Maxwell’s for our dinner. 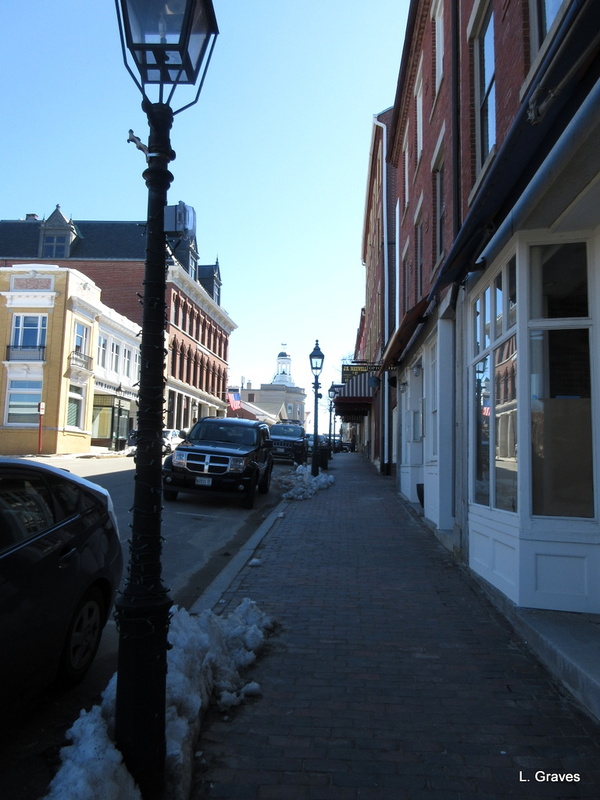 Downtown Bath is charming, and here is a shot of the main street. At home, we almost never eat meat, so Clif decided to indulge by having a steak. 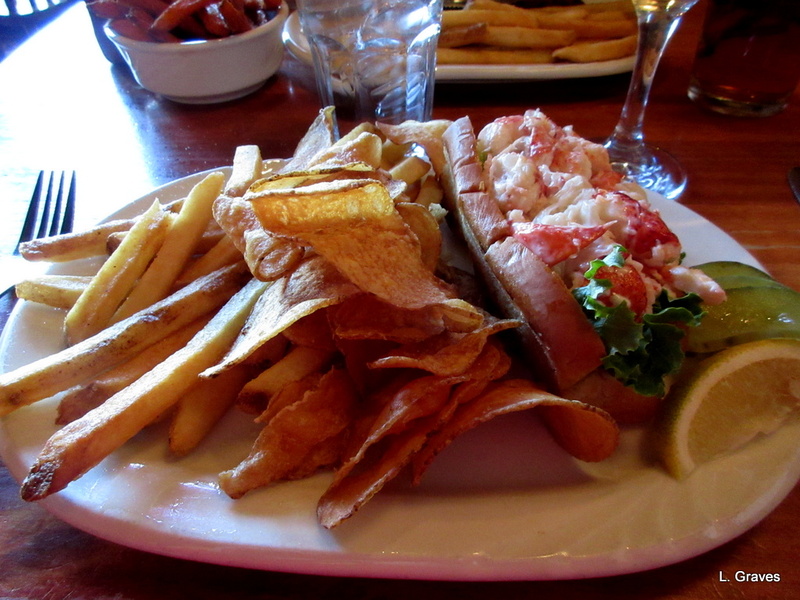 Lobster is also something we rarely eat, and I had my own indulgence—a lobster roll, my favorite way of eating lobster. You might notice that there are both chips and fries on my plate. This is because I couldn’t decided which one to order, and our server suggested that I could have half and half. The fries were good, but the homemade chips were fantastic, perfectly cooked. If we ever go back to this restaurant, I will just order the chips. And by the way, the lobster roll was pretty darned good, too, made just the way it ought to be—pure lobster meat with just a hint of mayonnaise. Foodies from away like to suggest adding this or that to the lobster salad, and to them I say, “Nonsense!” There are some things that should just be left alone, and lobster salad is one of them. After this fine meal, did we want dessert? We did not, at least not right away. But after an hour’s drive back to central Maine, we decided that maybe, just maybe, we could force ourselves to have a sundae at Fielder’s Choice. 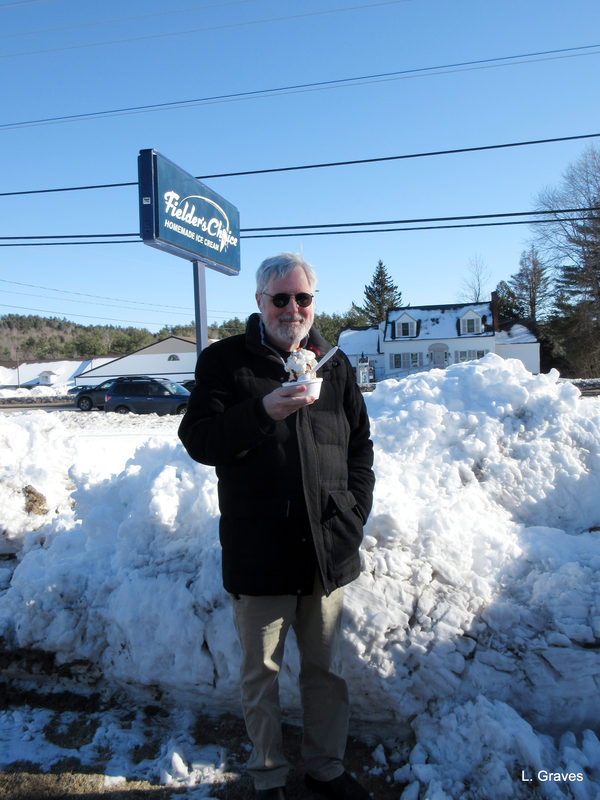 A sweet ending to a sweet day for a couple of crazy Mainers who go out for ice cream even when the snowbanks are high. Cheers from an old married couple! Happy anniversary! For a moment there when I read the title, I thought you were visiting the UK! If only! Sigh. My fantasy trip. But our Bath is a nice little city, albeit not as storied as yours. If ever I do come to England, I will be sure to let all my blogging friends know so that we can meet for tea, lunch, whatever! What a treat that would be! Perhaps we’ll make it to Maine before you get to the UK… it’s so long since we visited, but elderly dog has rather halted our travelling recently. We are in the same boat. Dear old dog buddies. Cheers!!! What a lovely celebration. Cheers right back at you both from another married couple. 🙂 As I’ve said before, I REALLY like how you celebrate special life events. Happy Anniversary, Laurie! I enjoyed this lovely outing with you, now I think have to prepare supper, I feel very hungry. 😉 Now I’m curious; was your martini without martini, only with vodka and Bailey’s Irish Cream? Many thanks! In the U.S., martinis are made with vodka as well as gin. This martini had no gin, only vodka. The purist would probably not approve, but it’s good for me as I don’t care for the taste of gin. Looks like a perfect day, Laurie. Happy Anniversary! What a lovely way to spend your anniversary. Thanks, Susan. It really was. Sounds like a fine outing. I love the pic of Clif in front of the snowbank –classically cold! Yes, classically cold. Such a nice day. Cheers to the happy couple. Happy Anniversary!! I really like the idea of celebrating in stages…and savouring every bit….. I’m with you on the ice-cream, winter or summer, any time is a good time for an ice-cream! Clif came up with a good plan. Yay for ice cream! What a very happy day you had! Happy Anniversary! Oh, thank you for sharing your special day with us. It looks like you had a blast! Happy Anniversary, kids! Thanks, Jodie! We had a wonderful time. I think outings are the best way to celebrate birthdays and anniversaries, since they give special memories to the day! This sounds like the perfect day to me! Yes, indeed! A wonderful day, that’s for sure. Nice! 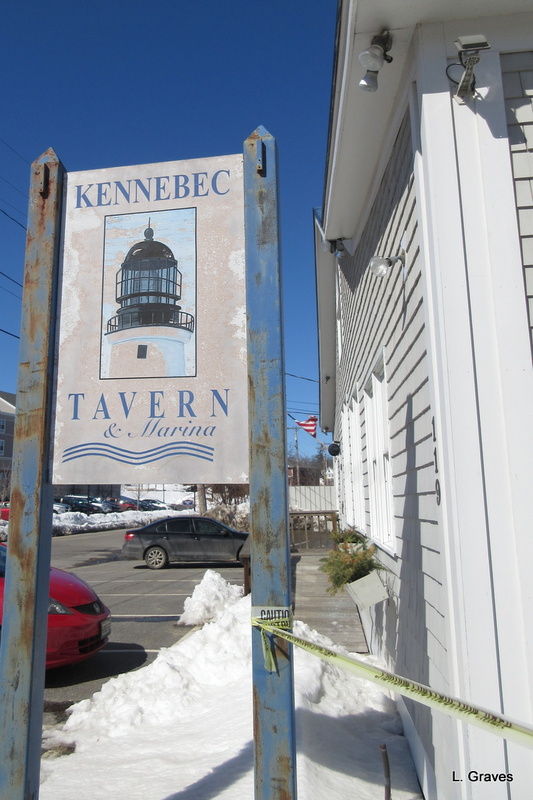 I have never been to the Kennebec Tavern. I shall have to get over there! Happy Anniversary! So lovely to eat and drink while watching the river.